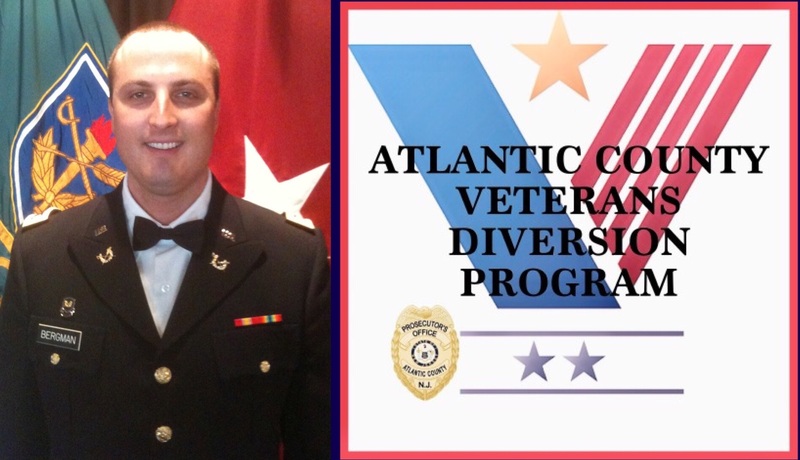 MAYS LANDING- US Army veteran, Chief Assistant Prosecutor Erik Bergman also serves as the coordinator for the ACPO Veteran’s Diversion Program. “As of today we currently have nine participants in the program. The participants meet monthly in front of Presiding Judge Bernard E. DeLury to assess their progress,” Chief Assistant Prosecutor Bergman said. Chief Assistant Prosecutor Bergman said the program has one volunteer mentor, but more volunteers are needed. Under the new VDP, eligible veterans who are charged with certain qualifying crimes may be eligible for diversion to rehabilitative treatment in lieu of the traditional criminal justice process. The program involves intensive supervision and monitoring of a veteran’s treatment by an applicable treatment provider, the Veterans Administration (VA), this Office, and a volunteer mentor assigned to support the veteran. Participants must meet all diversion requirements to remain in the VDP, and the program must be successfully completed within two years from the date of diversion. Veterans admitted into the program are expected to regularly attend counseling and, where applicable, receive mental health or substance abuse treatment in accordance with VDP conditions. A veteran who successfully completes the terms and conditions of this program to the satisfaction of the prosecutor, has not been the subject of any subsequent criminal charges and continues to make progress with mental health and/or substance abuse treatment shall have his/her charges dismissed. To be eligible for the VDP, the applicant must be an Active (to include Reserve and National Guard servicemembers) or former member of the United States armed forces and the charges must have some causal relation to their military service. The Atlantic County Prosecutor’s Office retains sole discretion over who is admitted into the VDP. Veterans charged with more serious, violent crimes will not be deemed eligible for VDP participation. In November 2010, Chief Assistant Prosecutor Bergman was commissioned as a First Lieutenant in the U.S. Army Reserve JAG Corps in and assigned to the 154th Legal Operations Detachment in Alexandria, VA as a Trial Defense Counsel. He graduated on the Commandant’s List of the Judge Advocate Officer Basic Course in Charlottesville, VA in October 2011. He was transferred to the 16th Legal Operations Detachment in Fort Hamilton, Brooklyn, NY in 2012 as a Trial Defense Counsel. Primary duties as a Trial Defense Counsel are to represent Reserve Component Soldiers in U.C.M.J. and Administrative Separation actions initiated by the Army. In May 2012, he was promoted to the rank of Captain. He supported Active Duty units on two Overseas Duty Tours in Germany in 2014 and 2016. THANK YOU FOR YOUR SERVICE TO OUR COUNTRY AND ATLANTIC COUNTY, CHIEF ASSISTANT PROSECUTOR BERGMAN!